Yet instead of welcoming this rush of familial interest, at some schools we find principals, superintendents and every level of functionary in between doing whatever they can to impede parental will. Most administrators don’t actually go so far as out right refusal of a parent’s demand to opt out their children. That’s especially true in states where the right to opt out is codified in the law. Three states – California, Utah, and Wisconsin – have enacted legislation permitting parents to opt their children out of standardized tests. However, at least five others, including my home of Pennsylvania, have laws respecting parents’ opt-out wishes for certain reasons. In others states there may not be specific legislation permitting it, but none have laws forbidding it either. At worst, test refusal is an act of civil disobedience like tearing down a confederate monument or freedom rides. In Pennsylvania, the school code specifies that parents can refuse the test for their children for “religious reasons.” Those reasons and the religion in question never need be named. Citing “religious reasons” is rationale enough. So when a parent provides just such an objection, it’s there in black and white that administrators must comply with that request. However, some administrators are trying to game the system. When the other students are taking the state standardized test, the opt out students are rounded up and forced instead to take a district created assessment that just so happens to look almost exactly like the test their parents explicitly asked they not be subjected to. So in my state, some parents have opted their children out of the Pennsylvania System of School Assessment (PSSA) or Keystone Exams, but administrators are requiring them instead to take an assessment they cobbled together themselves that closely resembles the PSSA and/or Keystone Exam. They take a little bit from the PSSA, a bit from the Partnership for Assessment of Reading Readiness for College and Careers (PARRC) test, a question or two from the Scholastic Assessment Test (SAT) and voila! A brand new Frankenstein’s monster of standardized assessment. But that’s not all. Some districts go one step further. They tie the results of this bogus “district” assessment with class placement. The results of the faux test are used to determine whether students are placed in the remedial, academic or the honors class in a given subject (English Language Arts, Math or Science) in the next grade. Does that violate the law? Parents did not want their children to be assessed with a standardized test, and that’s exactly what the school did anyway. The only difference is the name of the standardized test they used. I am not a lawyer, but I’ve contacted several. The answer I’ve gotten is that this may not be technically illegal, but it does at least violate the spirit of the law. Districts are given a certain latitude to determine their own curriculum and assessments. This kind of runaround is ugly, petty and possibly just on the line of legality. But our administrators are not done. Not only are they requiring such students to take a cobbled together standardized assessment, when children are done, they are forced to do hours of test prep for the state assessment that their parents refused for them. Imagine opting out of the PSSA and then being forced to spend that time preparing for that very test. Imagine refusing to allow your children to take the Keystone Exam but then having them forced to prepare for it instead. Petty, small-minded, punitive and – in this case – possibly illegal. Again, I am not a lawyer, but it seems pretty clear that this, at least, is a violation of the law. They can request their children not be given specific instruction – in this case test prep. Yet that’s exactly what administrators are doing anyway. So what are opt out parents to do? Should they lawyer up? Possibly. Though no one likes to have to take their own school to court. Any monetary damages thus recovered come from the collective pot that should go to help all students learn. It’s unfortunate that some administrators play so freely with taxpayer dollars when it would be a simple matter to safeguard them AND respect parental rights. A better course of action may be for opt out parents in such situations to seek redress directly from the school board. School directors are elected officials, after all. They may not be appraised of the actions of the administrators in their employ. And that is really where the buck stops. If school directors don’t approve of this sort of chicanery, they can easily put a stop to it. These are public schools. They are supposed to be run by the public. Our democracy is supposed to be what defines us. We are run by the people, for the people. We’re not some charter school where school directors are appointed to their positions, hold their meetings in private and rarely if ever have to account for their decisions. It’s shocking that in an age when public schools are often set against privatized ones that we’d allow such foolishness. We need to set ourselves apart. Instead of denying parental requests, we should go out of our way to accommodate them. Parents could, after all, remove their children and try their luck elsewhere. At charter schools, they would probably get an even worse welcome. After all, most such schools pride themselves on their test scores and test prep curriculum having kicked out any students who don’t score well. However, parents of means could enroll their children in private or parochial schools that are not required by law to even take these high stakes tests. I’m not recommending that course of action. These schools are expensive, restrictive, insular and extremely racially and economically segregated. But how short sighted must public school administrators be if they play these sorts of games with parents and children in just such an environment? Any public school leader who wars against opt outs is participating in their own schools demise. This is doubly so at schools serving high poverty populations. Children of the poor and minorities historically get lower test scores than those from wealthier families. These tests are used to justify budget cuts and firing school staff – including these administrators. Opting out of testing is one way to deny this data to the state so that they can’t use it against the school. Certainly having high numbers of students opting out can, itself, become an excuse for punitive action from the state. But nowhere in the country has it ever actually happened. State legislatures, too, are run by majority rule. The same with the federal government. Our lawmakers have no authority to tell voters they can’t opt their children out of testing. It is the voters who are the boss. We’d all best remember that. Imagine you could talk with Diane Ravitch for 10 to 15 minutes everyday. That’s kind of what reading her new book, “The Wisdom and the Witt of Diane Ravitch”, is like. You’ve probably heard of Ravitch before. She’s the kindly grandmother you see on the news who used to think standardized tests and school privatization were the way to go but actually had the courage to pull an about face. She’s that rare thing in public policy – a person with the honesty to admit when she was wrong — and even lead the resistance to everything she used to believe in! Now she champions teacher autonomy, fair and equitable school funding and authentic public schools with duly-elected school boards. 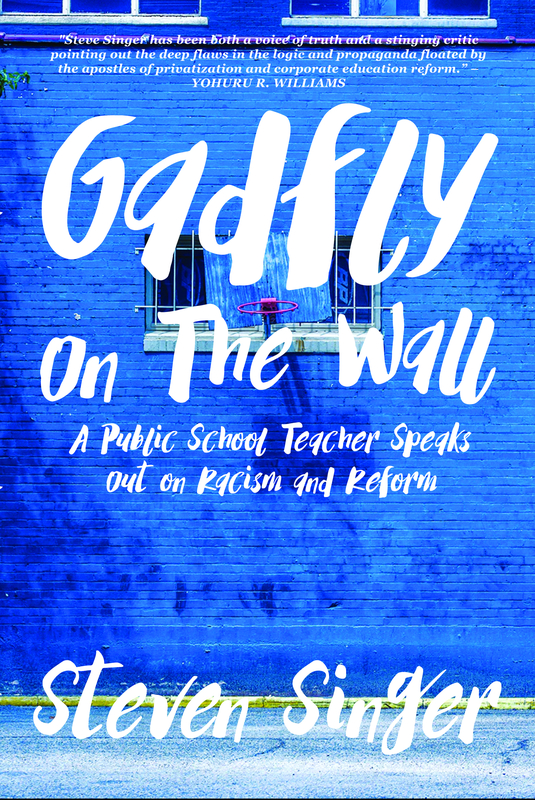 Her new book is full of shorter pieces by the education historian from all over the mass media – The Wall Street Journal, The New York Times, Huffington Post and even her own blog. You’ll find an article explaining why she changed her mind about school reform nestled next to a reflection on what it’s like to grow up Jewish in Texas. Here’s a succinct take down of President Obama’s Race to the Top next to an article extolling the virtues of student activism in Providence. Ever wonder what Ravitch would say to her mentor Lamar Alexander about our current Education Secretary Betsy DeVos? It’s in there. Ever wonder what books on education she would recommend? It’s in there. This new book from Garn Press is more personal than anything I’ve seen from Ravitch on the shelves before. And that’s because it’s not part of a sustained argument like “The Life and Death of the Great American School System,” or “Reign or Error.” It’s a collection of vignettes taken from the last decade of her writing. These are flashes of inspiration, snippets of thoughts, bursts of criticism and humor. They’re perfect for perusing and really quite addictive. I found myself jumping from an article in the first 20 pages to one at the end to another in the middle. There’s no reason any of it needs to be read chronologically though they are organized in the order of publication. It’s really a lot like talking to Diane, something that I’ve had the privilege to do on a few occasions. Like any conversation, topics come up organically and you go from one to another without rhyme or reason. At least that’s how I read the book. It would be perfect in your school’s teachers lounge. Educators could pick it up at lunch or during their planning periods and use it as a springboard to talk about almost any issue that comes up during the day. Well, it would be perfect if we ever actually had that kind of time. I found myself repeatedly interrupted when trying to read it. But that’s actually not a problem. Given the brevity of the articles and their impressive concision, it doesn’t matter if you have to put a bookmark in the middle of a chapter here or there. It’s easy to pick up the thread and continue later. As a public school teacher, I must admit getting an inordinate amount of pleasure from Ravitch’s criticism of the fools and frauds writing school policy. But she has a lot to say on so many subjects – standardized testing, Common Core, even the basic greed underlying the whole political mess. I could offer a dozen more quotes from the book. My copy looks like a rainbow with all the different colored highlights I’ve made through its 451 pages. So if you want my advice, go out and buy “The Wisdom and Wit of Diane Ravitch.” It’s a fun and breezy romp through the maze of school policy. Just keep a good supply of highlighters and bookmarks handy. After all, teachers and schools have changed. They no longer educate children today the same way they did in the 1920s when the first large scale standardized tests were given to students in the US. There are no more one-room schoolhouses. Kids can’t drop out at 14. Children with special needs aren’t kept in the basement or discouraged from attending school. Moreover, none of the educators and administrators on the job during the Jazz Age are still working. Instead, we have robust buildings serving increasingly larger and more diverse populations. Students stay in school until at least 18. Children with special needs are included with their peers and given a multitude of services to meet their educational needs. And that’s to say nothing of the innovations in technology, pedagogy and restorative justice discipline policies. But standardized testing? That hasn’t really changed all that much. It still reduces complex processes down to a predetermined set of only four possible answers – a recipe good for guessing what a test-maker wants more than expressing a complex answer about the real world. It still attempts to produce a bell curve of scores so that so many test takers fail, so many pass, so many get advanced scores, etc. It still judges correct and incorrect by reference to a predetermined standard of how a preconceived “typical” student would respond. Considering how and why such assessments were created in the first place, the presence of a racial achievement gap should not be surprising at all. That’s the result these tests were originally created to find. Modern testing comes out of Army IQ tests developed during World War I. These assessments were based on explicitly eugenicist foundations – the idea that certain races were distinctly superior to others. People took this research very seriously. States passed forced sterilization laws for people with “defective” traits, preventing between 60,000 and 70,000 people from “polluting” America’s ruling class. The practice was even upheld by the US Supreme Court in the 1927 Buck v. Bell decision. Justices decided that mandatory sterilization of “feeble-minded” individuals was, in fact, Constitutional. Eventually Brigham took his experience with Army IQ tests to create a new assessment for the College Board – the Scholastic Aptitude Test – now known as the Scholastic Assessment Test or SAT. It was first given to high school students in 1926 as a gatekeeper. Just as the Army intelligence tests were designed to distinguish the superior from the inferior, the SAT was designed to predict which students would do well in college and which would not. It was meant to show which students should be given the chance at a higher education and which should be left behind. And unsurprisingly it has always – and continues to – privilege white students over children of color. The SAT remains a tool for ensuring white supremacy that is essentially partial and unfair – just as its designers always meant it to be. Moreover, it is the model by which all other high stakes standardized tests are designed. But Brigham was not alone in smuggling eugenicist ideals into the education field. These ideas dominated pedagogy and psychology for generations until after World War II when their similarity to the Nazi philosophy we had just defeated in Europe dimmed their exponents’ enthusiasm. The modern wave of high stakes testing has its roots in the Reagan administration – specifically the infamous propaganda hit piece A Nation at Risk: The Imperative for Education Reform. In true disaster capitalism style, it concluded that our economy was at risk because of poor public schools. Therefore, it suggested circumventing the schools and subordinating them to a system of standardized tests, which would be used to determine everything from teacher quality to resource allocation. It’s a bizarre argument, but it goes something like this: the best way to create and sustain a fair educational system is by rewarding “high-achieving” students. So we shouldn’t provide kids with what they need to succeed. We should make school a competition where the strongest get the most and everyone else gets a lesser share. And the gatekeeper in this instance (as it was in access to higher education) is high stakes testing. The greater the test score, the more funding your school receives, the lower class sizes, the wider curriculum, more tutors, more experienced and well compensated teachers, etc. It’s a socially stratified education system completely supported by a pseudoscientific series of assessments. After all, what is a standardized test but an assessment that refers to a specific standard? And that standard is white, upper class students. In other words, the criteria for whether a question is chosen for future tests is if it replicates the outcomes of previous exams – specifically tests where students of color score lower than white children. And this is still the criteria test makers use to determine which questions to use on future editions of nearly every assessment in wide use in the US. Some might argue that this isn’t racist because race was not explicitly used to determine which questions would be included. Yet the results are exactly the same as if it were. Others want to reduce the entire enterprise to one of social class. It’s not students of color that are disadvantaged – it’s students living in poverty. And there is overlap here. Standardized testing doesn’t show academic success so much as the circumstances that caused that success or failure. Lack of proper nutrition, food insecurity, lack of prenatal care, early childcare, fewer books in the home, exposure to violence – all of these and more combine to result in lower academic outcomes. But this isn’t an either/or situation. It’s both. Standardized testing has always been about BOTH race and class. They are inextricably entwined. Which leads to the question of intention. If these are the results, is there some villain laughing behind the curtain and twirling the ends of a handlebar mustache? As in the entire edifice of white supremacy, intention is beside the point. These are the results. This is what a policy of high stakes standardized testing actually does. Regardless of intention, we are responsible for the results. If every time we meet, you punch me in the face, it doesn’t matter if that’s because you hate me or you’re just clumsy. You’re responsible for changing your actions. And we as a society are responsible for changing our policies. Nearly a century of standardized testing is enough. It’s time to stop the bludgeoning. It’s time to treat all our children fairly. It’s time to hang up the tests. NOTE: This article expands upon many ideas I wrote about in an article published this week in Public Source.